Updated: 7 p.m. | Posted: 11:45 a.m.
Catch-and-release-only rules will be in effect for walleye on Lake Mille Lacs when the season opens May 12, state officials said Monday. The rules are essentially a continuation of last year's controversial order that kept anglers from keeping the prized fish and the third consecutive season anglers will face catch-and-release only. Department of Natural Resources officials did note that because Mille Lacs' spawning walleye population has improved, they will not seek to close the lake completely to walleye fishing as they did for several weeks last summer. "It was a difficult decision and we knew that we weren't going to make many people happy with this at all," said Don Pereira, the DNR's fisheries chief. Mille Lacs' walleye population has been under close scrutiny as scientists try to figure out what caused it to plummet. They point to factors such as increased water clarity, invasive species like zebra mussels and spiny waterflea, and a decline in species like tullibee that walleye eat. Pereira said the catch-and-release regulations are needed to continue the recovery of the lake's walleye population, which is dominated by those hatched in 2013. The DNR wants to see more younger fish survive. Pereira said some of the fish caught by anglers and returned to the water will die anyway — a condition known as hooking mortality. 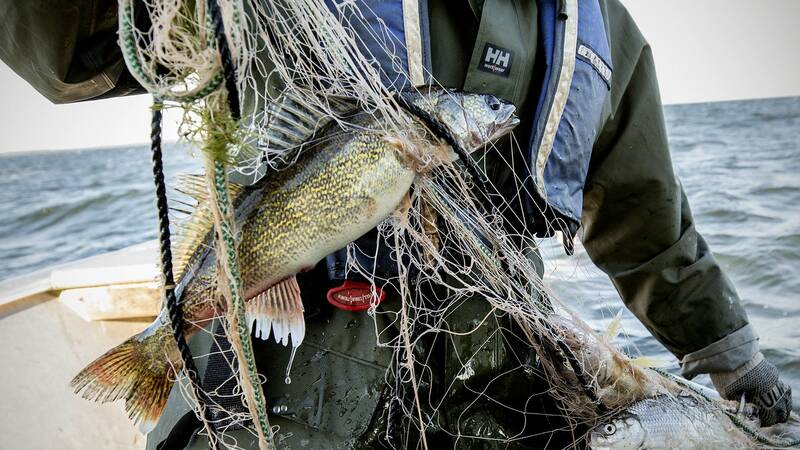 Still, news of catch-and-release only is likely to anger local resort owners who've argued the DNR's walleye management plans the past few years have wrecked their business because anglers want to keep what they catch. Terry McQuoid has owned McQuoid's Inn resort and guide service for more than 40 years. He said he's not surprised that the DNR decided to continue the catch-and-release policy this summer, but McQuoid doesn't think it's justified because he says fishing on the lake has been great. "It's very common last spring and each year here that we were catching anywhere from 50 to 100 walleyes a day on the boats and that. That's not a lake that's hurting by any means," McQuoid said. Some business owners, like Linda Eno of Twin Pines Resort, have been vocal critics of the DNR's management of Mille Lacs and the methods it uses to estimate the lake's walleye population. "Their process has brought this lake from six fish, to four fish, to two fish, to no night fishing, to no fish, to closure, to no live bait," Eno said. "And they will sit there and contend to your face that they've done a great job with their management system." A recent external review by a researcher from the U.S. Geological Survey found no major issues with the way the DNR gathers data on Mille Lacs' fish population. That didn't satisfy critics. Mille Lacs' walleye population has fallen significantly in recent years and officials have struggled to balance the demands of local businesses dependent on walleye fishing with the need to rebuild the fishery. Last year, the DNR not only closed Mille Lacs to walleye keepers, it stopped all walleye fishing for about a month in mid-summer, the peak of the season, to cut down on the hooking mortality of walleye who were caught and released but still didn't survive being caught. "Improving the walleye population on Mille Lacs is a top priority for the DNR," Tom Landwehr, DNR commissioner, said Monday in a statement as he announced catch-and-release only would continue this summer. "Anglers have had a very good winter walleye season on the lake and we will be able to continue that trend into the open-water season with no mid-season closure planned." DNR analyses, as well as external review, indicate that the walleye spawning stock has increased significantly in Mille Lacs and the lake can support a larger safe harvest level of walleye in 2018, if a catch-and-release rule is in place, DNR fisheries chief Pereira said in the statement.